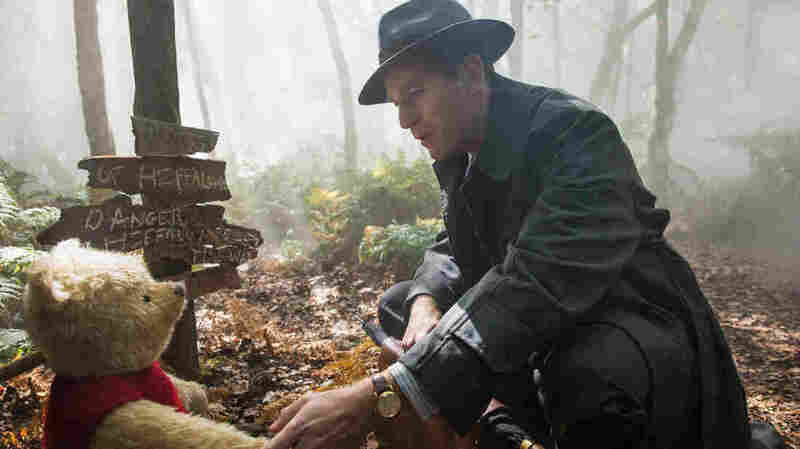 Overworked Man Gets Pooh Lease On Life In Sticky-Sweet 'Christopher Robin' A grown-up Christopher Robin (Ewan McGregor) returns to his childhood chums in the Hundred Acre Wood in Marc Forster's rote but charmingly animated children's film. In Christopher Robin, Ewan McGregor goes into the woods today; he's in for a big surprise. Will Christopher Robin Ever Grow Up? It's more common than not for beloved children's characters to live out their days in eternal youth, all the better to continue captivating new generations with their innocence. The thing about Christopher Robin, though, is that he's always been warning Pooh (and us) that he was about to grow up and leave the Wood. In the final chapter of 1928's The House At Pooh Corner, the child is preparing to leave for boarding school, and so all the animals throw him a farewell party, and he takes one last walk through the forest with Pooh, contemplating his fading childhood and the crushing sadness that comes with leaving your best friend behind for more adult pursuits. "Promise me you won't forget about me, ever," Christopher implores Pooh. "Even when I'm a hundred." And the bear agrees ... except Christopher has never made it to a hundred. He's simply been saying goodbye to six, in the same manner, over and over throughout the Pooh franchise, in the many other movies and TV specials that Disney has produced over the years. Oceans have risen, nations have fallen, yet the child, despite his best efforts, has remained a child. Peter Pan simply refuses to grow up, but for a century Christopher Robin has been preparing us for a heartbreaking day that never arrives. All that is to say some of us have been waiting a long time for this. And with Disney's newfound interest in its massive back catalog of properties, a return to the Hundred Acre Wood was inevitable, certainly a safer bet than the company's decision to, say, resurrect Pete's Dragon. But we live in a darker world now, one that leaves us feeling closer in mindset to the gloomy Eeyore than the bouncy, trouncy Tigger. Childhood is over. So it was time to grow up. Christopher Robin is what has emerged from this revelation. Helmed by Marc Forster as a cross between Hook and his own Finding Neverland, the film opens with that sun-dappled House At Pooh Corner goodbye before leaping ahead several decades into bustling post-war London. It's an admirable effort to do something different with these characters, even if it's often as sticky-sweet as the honey that Pooh can't stop eating. Christopher is a perfectly cast Ewan McGregor, an actor who often manages to look stately and boyish at the same time, and here he seems like a child reluctantly shoehorned into the body of Mr. Banks from Mary Poppins: suit and tie, long London umbrella, leather suitcase stuffed with important papers destined to be lost to the wind. (He works at a luggage company, and has to lay off staff to cut costs; "adulting" at its most soul-crushing.) Like the real Christopher Robin Milne, this one was shipped off to boarding school, served in WWII and then forged a life with his wife and daughter as far from the world of make-believe as he could get. But unlike Milne, who for much of his adult life resented the prison of eternal childhood his father had built around his likeness, the Disneyfied Christopher secretly pines for the times when he could do nothing all day with Pooh. Which means there's an easy solution to that pesky, irreversible nuisance of adulthood: Just bring Pooh back. So the bear of very little brain crawls through a tree trunk in the Wood and winds up on a London bench next to Christopher, who's once again canceled weekend plans to go to his cottage in Sussex — the real-life inspiration for the Hundred Acre Wood — with his wife Evelyn (Hayley Atwell is too good to just be playing wives) and precocious daughter Madeline (Bronte Carmichael). Let us now pause to sing the praises of these latest iterations of Pooh, Tigger, Piglet, Eeyore, Owl, Rabbit, Kanga and Roo, who all hew closer to Milne's original vision than the last few decades of Disney nips and tucks. The CGI looks astonishingly close to actual felt: You can see every little strand of fur on the animals, and the stitching down the middle of their faces. Their tiny button eyes and subtle motions project an innocence you don't see in the exaggerated cartoon movements and designs of similar live-action/CGI hybrid franchises. And the Robin family just kind of accepts their presence in the "real world," which is refreshing for those of us tired of every film like this needing to explain the logic of its magic portals. Forster had child actors stand in for the stuffed animals during filming, sometimes holding the Pooh toys themselves, while voice actor Jim Cummings, who has long played Pooh and Tigger in the cartoons, returns here to make every line of his dialogue sound like it's on the edge of tears. It's a shame the photography is so overly glossy, and that characters like Eeyore (Brad Garrett) frequently have their lovingly detailed features cut off by the frame — although the donkey himself probably enjoys having another excuse to be miserable. But there is one shot during a car chase when we are inside a small, locked trunk holding Piglet, Tigger and Eeyore, and the magic of the perspective allows us to be cozy and snug right next to Piglet even as big, scary things are happening out of our view outside. It's the moment when the film comes the closest, visually, to the peculiar sense of identification we have with characters who are both products of, and stand-ins for, our childhoods, waiting for us to remember them so we can all once again feel safe. The narratives of the Poohniverse have always been simple, which is part of their charm. Yet it's disappointing that the script for Christopher Robin feels so rote and devoid of true emotional complexity, given what it's trying to accomplish. The names on the screenplay are a fascinating cross-section of styles, speaking to how broadly and effectively the character has touched people over the years: indie auteur Alex Ross Perry, Spotlight helmer Tom McCarthy and Hidden Figures writer Allison Schroeder are three of the five credited writers who took cracks at this story. What of their contributions survived? The final film spends much of its 104 minutes making sure Robin is practicing what today we call "self-care": Make time for your family, don't let your job become your life, be sure to wander without a destination. It takes him forever to learn these things, and his wife and daughter don't get in on the fun until late in the game; a few encounters with odd-duck Londoners and a pleasant enough homage to The Red Balloon stand in for a recognizable story until then. Mostly it's all just a bit too easy. Pooh and his friends are stuck repeating the same aphorisms and catchphrases that made them famous, yet it's somehow enough to make Robin see the error of his grown-up ways. This might make you wonder: What is this fabled lost childhood we all look to Christopher Robin for, anyway? Is it just a Pavlovian checklist of songs heard and silly things said when we were very young? Or is it a more general feeling of security, not unlike the sensation of playing with our stuffed animals in tall grass on a sunny day, that drives us again and again to track down a Hundred Acre Wood we can never quite find for ourselves?